The Mets are easy to make fun of, and the 2011 Mets were supposed to be particularly ripe for mockery. A new management team had been put in charge to fix the mess Omar Minaya created, but thanks to contractual and financial constraints, there wasn’t much for them to do until 2012. Mets fans faced something even worse than a rebuilding year: a year to survive before the rebuilding. Watching games this season was going to be like drinking the grounds at the bottom of a bad cup of coffee. But a funny thing happened: Jose Reyes turned the 2011 Mets into the franchise’s most fun team to watch since the 2006 near-champs, and Mets fans turned from cynical observers of a big-budget fiasco into the exuberant followers of a scrappy up-and-coming squad starting to make its run. Reyes, the team’s shortstop, has been in Queens for so long (he was a day short of 20 when called up in 2003) that it had already started to feel as if injuries had sapped his potential. But he’s been the best player in the National League this year (leading it in the sabermetrics stat Wins Above Replacement as well as batting average), electrifying fans and teammates alike with his enthusiasm and multifaceted talent (hitting, running, fielding, smiling). He has an outside chance to challenge the all-time record for triples in a season, set by Chief Wilson way back in 1912, when triples were so easy to procure that you were given four free ones each year just for being a property owner. (Fine, fine: he’s on pace for 26 and the record is 36. But still, the last time anyone had even 26 triples—Pittsburgh’s Kiki Cuyler, whose middle name was “Shirley”—was 1925.) He fits well at Citi Field literally—while fence-swinging teammates like Jason Bay and David Wright are vexed by its mammoth dimensions, Reyes smashes line drives into the park’s expansive gaps—and figuratively, driving ticket sales for a franchise that sorely needs revenue right now. The reaction to Reyes’s recent injury was telling. He left a game against the Yankees with a strain of his left hamstring and may be out until the last week of the month. Had that happened earlier this season, when the Mets were supposed to be shipping out all their best players for minor-league flotsam, it would have been another indictment of the front office—those hapless Mets again, not trading their best asset when they had a chance. The team probably isn’t quite good enough to make the playoffs this year, having the misfortune of playing in the same division as the Braves and Phillies, the National League’s two best teams. (Baseball Prospectus’s Playoff Odds Report calculator gives them less than a 3 percent chance of making the postseason.) Reyes is a pending free agent, and many contending teams could use him in the stretch run. Why wouldn’t they trade him? Isn’t that what this year was supposed to be about? Ah, but it’s not like that anymore: Instead, fans are eager for Reyes to return not to boost his trade value but because of the show he and his team are putting on every night. 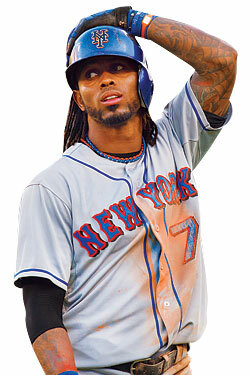 Reyes is now highly unlikely to be traded, not because the Mets aren’t still planning for the future, but because they and their fans now understand that ­future absolutely must include him—and that a team with Jose Reyes hitting his prime is almost by definition a team on the way up.